Frog God Games has released Quests of Doom 1 (5e) for the Fantasy Grounds VTT. A dozen 5th edition adventures for your FG 5e ruleset for $19.99. Whether or not you use the Fantasy Grounds VTT, the announcement that Frog God is dipping it toes into the digital market place is exciting news. Maybe in the future we'll see some releases for Roll 20. 12 Adventures for Fifth Edition Rules, First Edition Feel! Necromancer Games is back: are you ready to rock the new edition old-school style? We put together a team of some of the best adventure-writers in RPG history to ring in the new fifth edition rules with a host of adventures you’ve never seen before (and a couple that you have, but probably didn’t survive anyway). 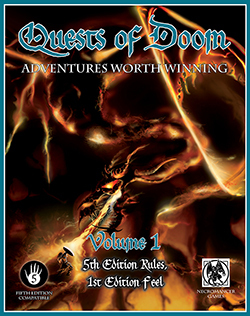 Volume 1 of Quests of Doom contains 12 adventures in almost 200 pages, by Ed Greenwood (Emeralds of Highfang), Bill Webb (Ra’s Evil Grin, Sorcerer’s Citadel, Hidden Oasis, Pyramid of Amra, Sewers of the Underguild), Matt Finch (Hidden Oasis-Temple of Thoth), Jim Ward (Deep in the Vale), J. Collura (Noble Rot), Michael Curtis (The Dead from Above), Casey Christofferson (Ra’s Evil Grin, Sorcerer’s Citadel, Irtep’s Dish), Skip Williams(Death in Dyrgalas), and Steve Winter (Bad Moon Rising). Requires: An active subscription or 1-time standard or Ultimate license of Fantasy Grounds and the built-in 5E ruleset. Very happy about this. I would love to see FG Rappan Athuk sometime before I die.